I loved everything about this book! It's about an older woman, Britt Marie, who recently left her cheating husband to venture into the world on her own for the first time in her life to gain independence and really learn who she is, and what she's made, of in the process. At first Britt Marie comes across as a very cynical, closed minded character who is so set in her ways and opinions that she cannot see anyone else's point of view, however, as the story progresses the layers of Britt Marie begin to lift away and a sweet, caring, grandmother-type is revealed, as are the reasons for her hard exterior, as her past is explained. 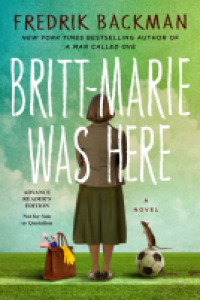 Britt Marie ends up taking on a job at a recreational center in a forgotten little town that has gone bankrupt where very few residents still remain. While there she unexpectedly finds herself elected as the new coach for the children's youth football (aka ⚽️ soccer in the US) and shortly discovers that she needs the underprivileged but well meaning children in her life just as much, and possibly more, then they need her, and an unlikely friendship is formed. The dry humor and ironic wit that Fredrick Backman is notorious for makes this book hilariously entertaining but it also has a softer side that really touched my heart and drew out a few tears. I haven't read one of his books that I didn't absolutely love and this is certainly no exception! His characters are unique, unforgettable, and impossible not to adore and his writing style makes his books impossible to put down even though I never want them to end!